Treffen Sie alle Highlights der australischen Blue Mountains auf dieser Tagestour von Sydney aus. 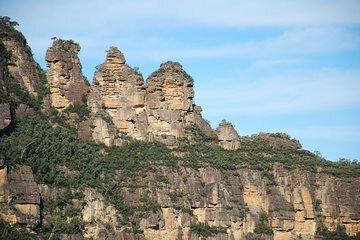 Sehen Sie einheimische australische Tiere im Featherdale Wildlife Park, sehen Sie die berühmten Three Sisters im Echo Park und fahren Sie dann in Richtung Scenic World (alle drei Fahrten inklusive). Anschließend geht es mit einer Flusskreuzfahrt auf dem Parramatta zurück nach Sydney, wo Sie am Circular Quay oder Darling Harbour absteigen. Nationalparkgebühren und Hin- und Rücktransfer von ausgewählten Hotels inklusive. We had a great day which was full of a variety of different things to keep us entertained throughout the day. The weather was excellent which made the views at the lookout point spectacular. Our rep was very good with a pleasant approach and kept us informed on the journey. Wow! Such a great day out from Sydney. We had an awesome guide (Jed) who was extremely knowledgeable, hilariously funny, and super organised! Loved the wildlife park, Jed even ensured it stopped raining while we were there! He took us to some of his top secret spots with awesome views. The blue mountains were a sight to behold and walking along under the canopy of the rain forest was pretty special. The rides at Scenic world were great too, although when on the train make sure you hold on to your personal belongings! Thanks for a memorable trip! Thoroughly enjoyable tour. Loved Featherdale Wildlife Park and wish we had longer. Blue mountains are beautiful. Need reasonable fitness. River cruise was great and lunch was fine. Choice if 8 items. Our guide Jed was terrific, funny and kept us entertained and had lots of knowledge. Be prepared for a full day. Skip the lunch not that great you have plenty of time and plenty of places t choose from. Rest of the trip was well worth it. Good value, attractions were great, tour allowed enough time to discover each, lunch provided was good and our guide was polite and helpful. We loved this tour from the beginning where we communed with the koalas and kangaroos to the end where we got great views of the famous Three Sisters. Scenic World's steepest train ride was a highlight. Great tour and well worth the cost. Our tour guide Jed was very knowledgeable and friendly. This package was worth the scenic ride skyway, cable ride, train ride however we could not catch a proper glimpse of the 3 sisters due to thick mist and rainy day.